You can not directly pin a RDP connection to the start screen for some reason in Windows 8, even the native Windows 8 Remote Desktop Metro application you can not pin a connection directly to the start screen. To work around this issue you will need to follow these simple steps. 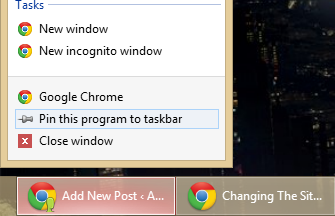 You will be able to pin this shortcut to the start screen or the taskbar, and remote desktop will now directly launch the connection. This entry was posted in Server 2012, Windows 8 and tagged Metro, Remote Desktop, Server 2012, Windows 8, Workaround on February 15, 2013 by nightred. If you are supporting custom software or older line of business software that your organization needs to operate you might come across an issue with Ghostscript and windows 8 64 bit. The issue is simply when you try to add the Ghostscript printer windows 8 will look like it is stuck in a loop, if you check the error logs you will find an error that look like this. After the system has finished restarting for the final time you will be able to add the Ghostscript printer to windows 8 64 bit. The final item of note is that you must select “File: (print to file)” as the port for the printer as “LPT1” will not work. You can download the latest version of Ghost script from this website http://www.ghostscript.com/. This entry was posted in Windows 8 and tagged Driver, Fix, Ghostscript, Printer, Setup, Windows 8 on December 14, 2012 by nightred.